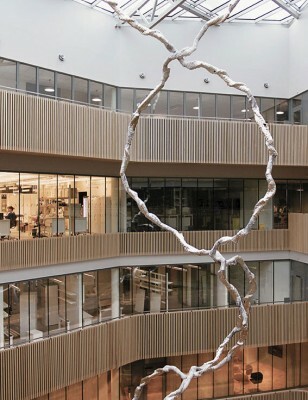 Installation artist and sculptor Monika Grzymala from Berlin/Germany and her team of structural engineers, metal smiths and industrial painters have designed and realized the sculpture Helix (Raumzeichnung Uppsala) especially for the new atrium of the research centre called Hubben at Uppsala Science Park. The work of all 35 modules was prefabricted in Germany, then transported to Uppsala and assembled on-site in the beginning of 2018. 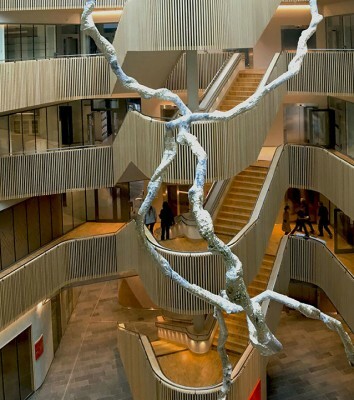 The organic formation goes 24,5 m up into the air, meandering from the floor to the glass roof of the Atrium in Uppsala in two individual strings. The predominantly tensile structure is anchored to the support grid of the glass roof and floor. 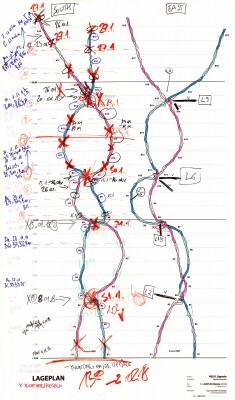 Each string consists of a steel tube onto which a second acrylic tube was wrapped around. This bundle of tubes was coated afterwards with a GFRP mat and with a highly reflective acrylic paint.